We are excited to recognize Dr. John Wott, Director Emeritus of UW Botanic Gardens, who has been awarded the 2019 American Horticultural Society Professional Award for his many contributions to the horticultural field throughout his career. We also extend our enthusiastic congratulations to Riz Reyes, UW graduate, former UW Botanic Gardens horticulturist, and current UW Farm volunteer, who was honored with the 2019 Emerging Horticultural Professional Award. Our organization and our local horticultural community benefit so much from their participation! Given to a public garden administrator whose achievements throughout his or her career have cultivated widespread interest in horticulture. First awarded in 1953. Director emeritus of the University of Washington Botanic Gardens in Seattle, John Wott has had a significant influence on horticulture in the Pacific Northwest over the course of a distinguished horticultural career that included work in the Cooperative Extension service, teaching, and public garden administration. Wott was appointed Director of the Washington Park Arboretum in 1993, becoming its first on-site director in 20 years. During his 13-year tenure as director of the 230-acre property, he helped in planning and developing the arboretum’s Master Plan, reconciling the often competing interests of various stakeholders such as the university, the city of Seattle, immediate neighbors, and state government. At the time he joined the arboretum, Wott was a horticulture professor at the University of Washington, where he played a major role in the development of the university’s Center for Urban Horticulture. He continues to encourage graduate students in the horticulture program through his support of the John A. Wott Fellowship. Given in the early stages of an individual’s career, this award recognizes significant achievements and/or leadership that have advanced the field of horticulture in America. First awarded in 2017. Inspired by tropical fruits and flowers since he was a child, Rizaniño “Riz” Reyes is a garden consultant and floral designer in Seattle, Washington, known for creatively embracing horticultural diversity with a sophisticated style that belies his 30-something years. 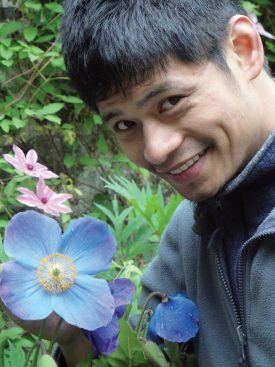 His early passion for plants led him to the University of Washington (UW), where in 2006 he earned a degree in environmental horticulture and urban forestry with a specialization in public horticulture. He then worked as a horticulturist at the UW Botanic Gardens Center for Urban Horticulture for several years, as well as operating a small nursery on the side where he propagated rare and unusual plants for Northwest gardeners. In 2015, he took on his current role as gardens manager for the brew pub and hospitality company McMenamin’s Anderson School in Bothell, Washington. Reyes also maintains his own enterprise, RHR Horticulture & Landwave Gardens, overseeing private landscapes and designing cut flowers, in addition to teaching and lecturing for various garden clubs and professional organizations. He volunteers with the UW Farm, where he spearheads its cut flower program and mentors younger horticulturists from nontraditional backgrounds.